Bonjour from Guadeloupe and the French West Indies!!! Some catching up to do! We have come full circle as some would say. …..Arrival in the Virgin Islands ON OUR OWN BOAT!!! Our journey has now taken us 1500 nautical miles since our departure from Georgia in late November. We still have several hundred miles and more than 3 months travel ahead of us but we have made it to familiar sailing grounds, and the place where we first built the dream AND where we first met Lost Loon. It’s been a great day up to now…. That is a phrase I received after greeting a local fisherman on the docks at Red Hook the other day. It was a bright sunny hot day, he was sitting in the shade to keep cool. I chuckled as he said it so confident and kindly. I guess you could take that many ways. I prefer to believe he was just saying that life was good, whatever it brings. Someone might think he was pessimistic about what the day could bring. I have to admit that each day we have been on this journey has been great. We wake up in calm waters after a great nights sleep on the water. And we have sailed by some incredibly beautiful islands from a vantage point that is not visible to the usual traveler. ( ok…some not so restful nights…more on that soon). We have the good fortune to be able to follow this dream. Our sail from the Spanish Virgin Islands was perfect. We left Culebra after spending time on coral reefs ready to move along. 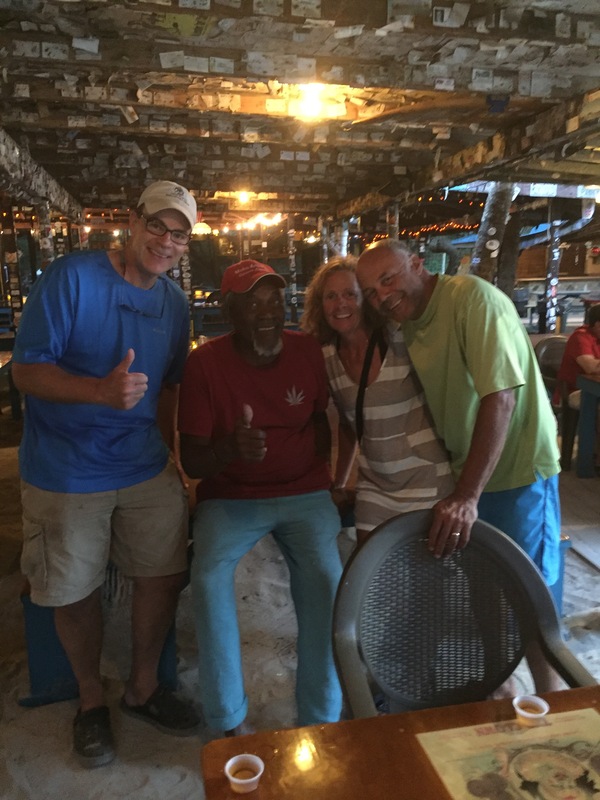 We decided that since Jeff, our close sailing friend ( who had accompany us on 2 previous BVI vacations) was along we would make the obligatory first stop in Jost Van Dyke, and Foxy’s bar. There are many beach bars in the islands, but few have the settled reggae feel as Foxy’s. They also make a pretty good “painkiller”, drink of the BVI’s. It is THE drink of the Virgin Islands!! Ok, ok the recipe…. and you can’t just make one glass you need to make a pitcher of them. One large can of pineapple juice, one can of Coco Lopez cream of coconut, splash of orange juice, appropriate amount of dark rum to taste ( many …er , um well you know who you are….prefer Pusser’s .. it’s made here in the BVI’s!). The final ingredient is the most important….topped with freshly grated nutmeg! Yeah, I know all about the calories….but after a long days beautiful sail, putting sails up, moving them in, staysail out then in, repositioning the boom to ease or tighten the main, recoiling lines for the 100th time,( just to let them out again), rigging a preventer, reducing sail for a squall, flaking the main back in its home on the boom, setting anchor, diving to check the anchor, and finally deploying the dinghy…..we are ready for a few delicious liquid calories. And when in Rome? We had done all that on our trip to Jost and made our way to the bar. It was a quiet afternoon, as the height of the charter season was just getting underway. So familiar faces like Foxy come easy amongst the few we met ashore. After enjoying some evening beach music and dancing we headed back to the boat. Upon leaving, we thought it was a joke when Jeff, who had been with us a week now, said ” where did you put the dinghy?”. Ha ha we laughed and walked further to the dinghy dock, where … it was gone. Terror struck, we searched up and down the dock. ( All these 10 ft rubber rafter tend to look alike in the dark, it had to be here. We couldn’t believe that we locked our precious means of transportation and it was taken. ( It was a great day…. up to now!) I remembered the friends who had their motor stolen recently, told us they began walking the beach to find their motorless dinghy. I kept saying, “no way this is happening,”….And Just 100 ft or less walking the beach here was ” Little AB”, ( AB is the manufacturer of the dinghy…the letters are written on the side ( like all the hundreds you see on docks here and she’s actually average size a decent 9 ft in length…as dinghies go) beached and totally intact. Nothing missing, just sleeping there as the water quietly lapped up onto the sand. We never figured it out. The lock was gone, but the secure wire intact. And the motor as well still perched on the stern. ( now this is the theft-proof motor we bought from Sebastian on One Life in the Bahamas. The bolts were broken off, and in order to remove from the transom Mike has to use some pretty heavy duty wrenches, it’s not just inscrew it and lift it off…maybe too much trouble for the motor thieves?) Or had the lock not caught and she just came loose? Did some kind soul then just nudge her to shore for us to find? , or did she just lazily find her way waiting for us to return? Lesson learned: double check the lock and also tie the painter line to the dock for extra measure. You can bet she was locked up tight on the davits that night. On our way to return Jeff to St Thomas, we made anchor at St James island and enjoyed more reef snorkeling. We stopped at Christmas Cove. It was a perfect overnight stop before going into busy Charlotte Amalie harbor. There were many boats likely with the same idea. We found pleasure in our favorite game …guess the boat. Since we are not close enough to see the manufacturer name ( and a lot of boats don’t have ) we look at the hull shape, sail configuration, (1,2 or 3 masts! ), the location of the cockpit, and number of headsails. Not unlike the old family road trip games we used to play. This also stimulates further discussion on preferences and the other game “On my next boat I’ll have….”. Finally arriving in Charlotte Amalie we were greeted by the typical sights and sounds of the big city….enormous cruise ships, sailing vessels and motor yachts of the rich and famous, street sounds, and almost continuous airplanes overhead, taking visitors into and out of paradise. So we stay just long enough to grab some wifi and re-provision ( need beer and some veggies…. ok so the rum is cheap here too!) On previous trips through here we have been restricted to staying in the BVI as the charter company didn’t allow us to check out of the BVI and into the US VI. So we have sailed past St. John and St Thomas with envy of more beautiful beaches and anchorages. This is our time. We can now go wherever we please as long as we make the customs stops. We leave St Thomas for St John. This island was deemed National Park in xXXX. So there is little in the way of development and resorts are few. Our first stop was to be Cruz Bay, but as we motored closer we noticed little wiggle room for our liking. We headed to close-﻿by Caneel Bay. As there is little residential building, the first impression is lush green mountainsides that rise steeply from the ocean. We found a nice spot not far from the beach and took our first mooring of the trip. This is a buoy attached to the seabed where you tie a line to the bow rather than anchor. Being national park waters, the idea is to preserve the ocean floor from the damage of anchors dragging on sand and grasses or coral that are home for all sea creatures. The island is know for its beautiful beaches and hiking trails. And for the second time on this journey I noticed the sound of birds along the hillside. It was a happy sound, cheerily greeting us to an overnight stay.We first began our morning with a trip to check out laundry facilities and look for a SUP paddle. You see, 3 days previous we found one afloat, lost and looking for a home, sans paddle. We put a call out on the VHF announcing our recovery of someone’s treasure but the owner was not located., or rather the owner didn’t locate us? Little did we know it would be easier to find the same exact propane selenoid ( gas control unit for propane tank, which went out last week) for the boat than it would be to procure even a used SUP paddle. This was waterworld….where are all the paddles???? We spent 4 days exploring St. John. That arrival day we hopped a 2$ bus that took us to the other side of the island on a mountainous sightseeing ride, hiked a trail along Honeymoon beach, and did locate the self-service laundry. Our bus ride took us to a Coral Bay and back. There were only a few stops, just to pick up passengers alongside the road stops. There would have been several photo ops had we been in our own vehicle, but we enjoyed the ride and met a man who lived there. He told us of old military ruins used in years gone by that stood atop these mountains, quite secure in its location and an excellent vantage point to monitor for intruders . As we rounded a corner at the peak of our little journey, we could make out many of the surrounding islands. He also informed us about great spots to visit. He was excited to share the information as we were appreciative. From some of the overlooks we passed, looking close you could imagine the huge volcanic craters that once existed now covered with outlying water across the panorama. Subsequent days we hiked to sugar can ruins, where we also walked to the plantation owners residence almost to the clouds. We read snippets and heard about the slaves harvesting the cane plants on the mountainside and the labor intensive work of making molasses or rum. The buildings they created out of stone and coral. You can see the coral in the walls. They also used the brick ballast from old ships to build structure into the doorways. It was amazing that these structures were built well above sea level, not an easy task to transport these materials. Trunk Bay was a spectacular day stop and our favorite spot on the island. The beach is white sand against the turquoise Bahamas-like water with vast mountain backdrop. We had a great snorkel here , a designated snorkel trail. There were even underwater signs directing the swimmer. Being a well-known beach it was very crowded with other land based vacationers. There were only 3 boat moorings here and we got lucky picking one up that day. We have this one on the list for a return visit. We would move back to the BVI in preparation for our trip further down the Caribbean chain of islands, but didn’t spend much time as we had seemingly exhausted ourselves here in previous years. Following a stop in Spanish Wells on Virgin Gorda to clear into and out of the islands we anchored in Leverick Bay. A wonderful bay on the north end of Virgin Gorda, rimmed by Mosquito and Necker Islands…owned by Branson of Virgin Air. He has some incredibly beautiful homes perched on the mountain tops of these islands. There is a non-pretentious marina there that will let you use their pool and showers ( however long awaited, the showers were only luke warm, but they were freshwater in abundance, something we don’t have the luxury of aboard). This is also the location for the famous pirate show Michael Beans. He is a former Michigan native that now lives in the islands and performs a great song and comedy routine as a pirate. When we were there Monday night it was THE biggest audience we had seen at one of his shows. There were rows upon rows of dinghies at the dock from all over the bay and anchorages. We had watched that day as a whole set of new vessels anchored and moored in that bay,just for the show.People dress as pirates and he does a conch blowing contest, sings a few songs with interspersed pirate or beach jokes…..
Before leaving this location we had the fortunate opportunity to dive on a great reef. It’s called the Invisibles. It is just off Necker island and is usually best in the summertime or when conditions are very settled. Well we woke up one morning with no wind and settled seas. We made a quick decision to take the boat out and make the dive. Aside from some pretty strong current, it was beautiful. We saw an array of reef fishes, structure that stood some 20-30 ft off the ocean floor, and vibrant coral of many types. Quite a treat for us as we had always wanted to make this dive in the previous years, but due to conditions were unable. As we sail away from the British Virgin Islands thru the night ( maybe our last overnight sail) to new waters of the Caribbean, I stay awake on my navigation shift by writing this blog ( and watching for traffic, managing the sails and navigating our course with the help of the autopilot) with hopes of finding wifi to get it posted in a timely manner. We will be making arrival in Sint Maarten. So best laid plans… we didn’t get this uploaded in Sint Maarten . Our next try will be either St Barths or Guadeloupe. Truly wonderful to hear about your travels! Dave and I are wanting to know where we should meet you for a ride! Lol! Safe travels!! Well, head down to Guadeloupe !